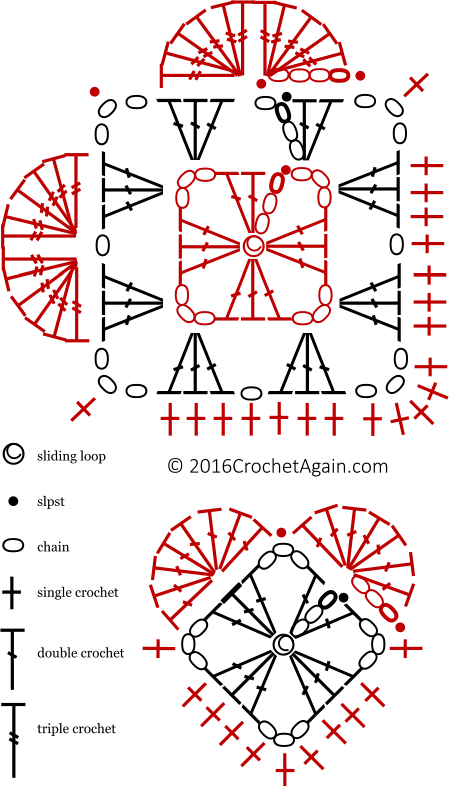 Make a sliding ring and ch4 (the first ch secures the loop, the remaining 3 count as the first stitch)(or ch4 and slpst to make a ring). In the ring: Dc, ch3. [3dc, ch3] 3 times. Close the loop, not too tightly to leave room for one more dc. Dc in ring, slpst through 2 loops of the top ch of the beginning ch4. Do not end off. Ch3. 7dc in same space as slpst. Skip next st, slpst in the ch3 space. Skip next dc, 8dc in the next dc. Sc in the next ch3 sp and in the next 3dc’s. 3sc in the ch3 space, sc in the next 3 sts and the last ch3 sp. Slpst through 2 loops of the ch3. End off, leaving a tail to weave in or to sew with. In the ring: 2dc, ch3. [3dc, ch3] 3 times. Slpst through 2 loops of the top ch of the beginning ch 4. Do not end off. Ch4 (counts as first st, ch1). [3dc, ch3, 3dc, ch1 in next ch3 sp] 3 times. In last ch3 sp: 3dc, ch3, 2dc, slpst to 3rd ch of beginning ch4. Do not end off. Slpst in ch1 sp. Ch4, 11 trc in ch1 sp. Slpst in next ch3 sp. 12 trc in next ch1 space. Sc in next ch3 sp. Sc in the next 3 dc, the ch1 sp and the next 3 dc. 3dc in the ch3 sp. Sc in each st and ch1 sp along the other side, sc in the last ch3 sp. Slpst through 2 loops of the 4th ch of the beginning ch4. End off. Weave in ends. Thank you for these two patterns of hearts in time for Valentine’s Day! 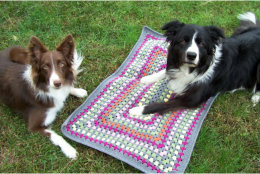 Whatever works well for you and the yarn you are using. I often use an H hook with medium weight yarns. 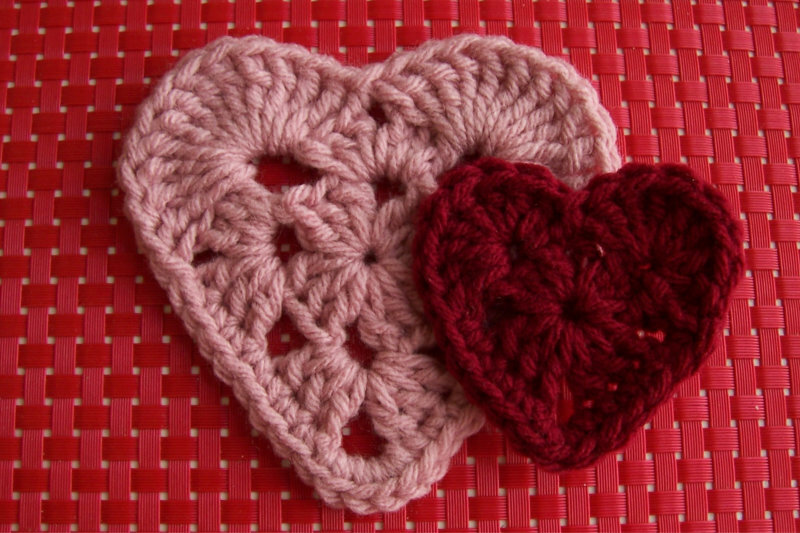 Have been looking for a pretty crocheted heart pattern, for some time now…and find yours to be by far the prettiest one. Thank you so much, for sharing it! 🙂 Gretchen B. Thanks! 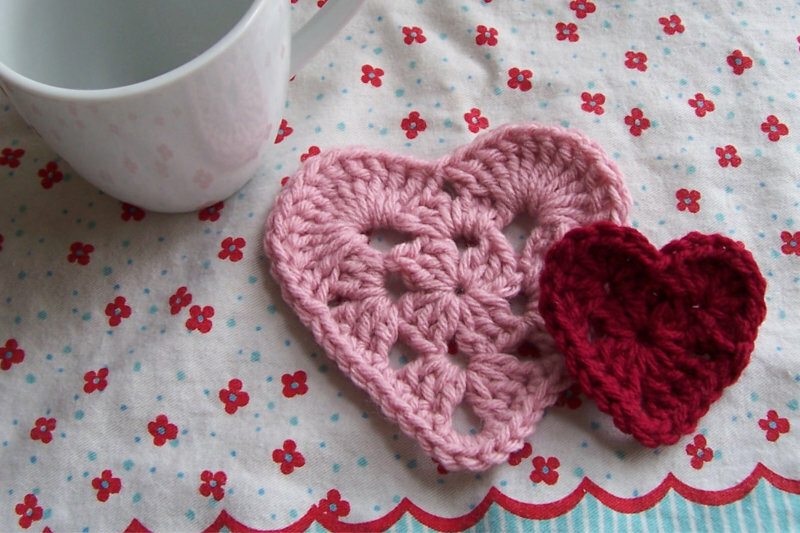 I made the larger heart today to attach to a coffee cup cozy that was too plain. It was perfect! And the directions were nice and easy to follow.